1.Electric Collar Size: adjustable collar allows shock collar for dogs from 10 lbs or Larger. Able to fit small, medium and large dogs. TPU collar size up to 25 inches long. 2.Training modes: 3 training modes to improve Basic Dog Obedience, Hunting, Digging, Aggressive, Barking control, Jumping up, and bolting. 4.Remote control: Up to 330 Yards training range, enhanced and safe conductive plastic contact points. 5.If you have any issues with your purchase collar set, please tell us and we will provide a full replacement or refund. 1. When the receiver is low power, the LED indicator will slop blinking. 2. The receiver will go to power saving mode 1minute if no movement and transmit signal. 3. You can choose channel 1 or 2 to pair the remote and device. 4. Do not use this product if your dogs is aggressive or your dog is prone to aggressive behavior. UPGRADE SINGLE BUTTON: Feature with single button for shock and vibration training modes is easy to operation than traditional dog training collar. "+" "-" button to control training level, it's more safety and simple for training your dogs. RUBBER OIL SURFACE: Use rubber oil surface technology on dog shock collar, it is better comfortable to grasp and use, let you enjoy cozy and soft surface in your hands. ADJUSTABLE TRAINING MODES: Different 3 colors button express different training modes.1-100 level of customization for both the static stimulation & vibration and Beep mode,3 training types to help correct your dog inappropriate behaviors. REMOTE TRAINING COLLAR: Dog training collar adopt with 433MHZ wireless Press and Act technology and rechargeable collar receiver,up to 330 yards training range for your dogs. 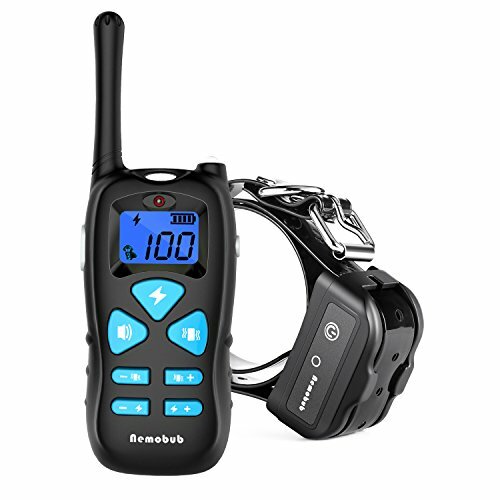 100% WATERPROOF AND ADJUST COLLAR STRAP: Premium shock collar with remote fits all dogs from 10-110lbs with an adjustable TPU collar size from 7 to 26 inches long,remote with battery tree bar display and receiver with lower power indicator, easy to know the power status. If you have any questions about this product by Nemobub, contact us by completing and submitting the form below. If you are looking for a specif part number, please include it with your message.